When the 2003 Stanley Cup Playoffs began, the Devils were supposed to have problems shutting down Boston’s sensational forward Joe Thornton. Five games later, Thornton and the Bruins were packing up their belongings and heading for the off-season. The grizzled veteran group of Devils were then supposed to struggle against Tampa Bay’s youth, including the dynamic duo of Vincent Lecavalier and Martin St. Louis. Again, after five games, the Lightning were sent home from the playoffs. Even so, the defensive-minded Devils were going to have difficulty containing the offensively-explosive Ottawa Senators, right? This team was loaded up front with Marian Hossa, Daniel Alfredsson and Martin Havlat. This one may have gone seven games, but you know who prevailed. If you’re a big fan, you remember it was at the Corel Centre in Ottawa, too. Mike Rupp and Jamie Langenbrunner celebrate Rupp's series-clinching goal in game seven as the Devils capture their third Stanley Cup in nine seasons by defeating the Mighty Ducks of Anaheim four games to three. Even though the Devils finished the 2002-03 regular season with 108 points, good for first-place in the Atlantic Division, they were never considered a favorite to win the Stanley Cup Championship. Not until, that is, they got to the finals and the Mighty Ducks of Anaheim, the Western Conference’s no. 7 seed, were standing in the way of the organization’s third Stanley Cup since 1995. Remember that the Ducks entered their first-ever finals with the league’s hottest goalie in Jean-Sebastien Giguere. The Ducks swept Detroit in the first-round, beat Dallas in six games in the Western Conference semis, and then toppled Minnesota in a sweep to reach the Stanley Cup Finals. Devils’ fans know what happened next. How could you ever forget? The Devils dispatched of the Ducks in seven games, winning the Cup on their home ice with a 3-0 decision on a game-winning goal by rookie right wing Mike Rupp and a pair from Jeff Friesen. The Devils won games one and two at home, each by a 3-0 score. They traveled cross-country, but Anaheim held serve on its home ice with back-to-back one-goal victories. The series returned to the Meadowlands for game five, and once again the Devils persevered for a 6-3 win. However, upon returning to Anaheim, with the Cup in the building, the Ducks forced a game seven with a dominating 5-2 victory. That was also the game in which Scott Stevens checked Ducks’ forward Paul Kariya with a monstrous middle-of-the-ice hit in the second period. Kariya, though, returned ten minutes later, and scored the goal that put Anaheim ahead, 4-1, with 2:45 remaining before the second intermission. The series had two prevailing storylines that had the rest of the hockey world riveted. First, it would become Daneyko’s final run in the NHL. After Coach Pat Burns made him a healthy scratch in favor of Oleg Tverdovsky in the first six games of the Cup finals, Daneyko was given the green light for game seven. He was on the ice, admittedly as nervous as the 19-year-old rookie he once was back in 1983, when the final seconds of the third period bled from the clock. Daneyko spent his entire 20-year career in a Devils’ sweater. “It was a storybook ending for myself,” Daneyko said. “Most importantly the team won, and going back in was obviously nice. I was nervous before the game because I hadn’t played in two weeks. I was hoping I wasn’t rusty. I knew I wasn’t going to play a ton, but one shift, one mistake could cost you the Stanley Cup. Martin Brodeur had an unforgettable 2002-03 season, winning the Vezina Trophy, the Jennings Trophy and the Stanley Cup. The Niedermayers, Anaheim’s Rob and the Devils’ Scott, were the other dominant storyline of the series. They were the first set of brothers to compete against each other in the Stanley Cup Finals since 1946, and their mother, Carol, was admittedly rooting for Anaheim so both her sons could own rings. The end, though, was bittersweet for Scott, who already had two championships, but still wants so badly to see his brother get a chance to raise the Cup. The Devils got to the playoffs thanks to yet another impressive season in net from Martin Brodeur, who won his first Vezina Trophy as well as the Jennings Trophy after playing in 73 of the 82 games and finishing 41-23-9 with a 2.02 goals-against average. It was Brodeur’s fourth 40-win season. He led the league in wins and was second in games played. Patrik Elias had a team-high 28 goals and 57 points. 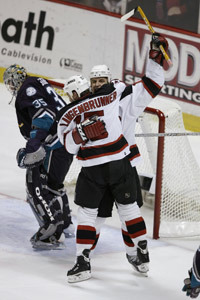 Jamie Langenbrunner and Scott Gomez each had 55 points, with Gomez registering a team-high 42 assists. Friesen had 23 goals, 28 assists and was a plus-23. They would roar out of them with their third Stanley Cup. Dan Rosen covers high school sports and the NHL for The Record (Hackensack, N.J.). He is a regular contributor to Center Ice Magazine.